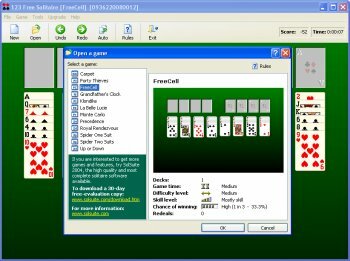 123 Free Solitaire is an exciting collection of many different Solitaire Card Games that features good layout, fast game play, rich sounds, extensive options, and good help. 123 Free Solitaire includes twelve great solitaire games: Diplomat, Eighteens, Flower Garden, FreeCell, Grandfather's Clock, Klondike, Pyramid, Royal Rendezvous, Spider, Spider One Suit, Spider Two Suits and Yukon. I have been using and enjoying 123 Free Solitaire 2003 Version 5.11 - Mar 19, 2003, TreeCardGames.com . It is definitely FREEWARE! I am downloading Version 5.30 right now and will post an update if it not freeware. Some features are crippled--undo does not work in the free version--but when I consider the price, I give it the highest rating.